Yes, I really did that. Yesterday I made a tiny felt beret for Millie to wear in France. She looks a tad like Henry VIII, but you get the idea. Anyway, we're all packed and running errands for a last round before we go. I'm very, very, VERY excited! For a few years now, Kaari runs a legendary getaway of adventures and wonders at this lovely chateau near Toulouse. 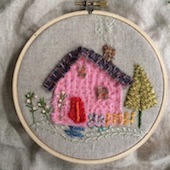 This is Textile Week and I'll be teaching embroidery. We're making a sampler I designed of the chateau itself, stitching details of the ancient structure, trees, lavender and sunflowers. There will be other mini-classes, woad dyeing and who knows what else. Leaving lots of room in my suitcase for flea market treasures and handmades. My friend, Jane and I are adding a few days in Paris to finish our trip. I'm going to spend my week with needle and thread, walking shoes, camera and friends, so I won't be posting here or to Instagram, but if you want to see what's up, Kaari and her sister Molly are posting. Check #frenchgeneralgetaway. After seeing last week's photos, it looks like every wish comes true there. My Etsy shop will also be closed until I return July 3. Hope everyone got their summer samplers for vacation stitching. Looking forward to sharing everything with you once I'm home again. Continuing with a sort of NYC bucket list for Grammy, yesterday was a good day to go. We wandered through the galleries upstairs and down, found the Impressionists, her favorites. I began to think about going to France in a week. The Schiaparelli and Prada exhibit is so inspiring and beautiful. It's there through August. As we walked through, I heard someone say, "Look, three generations." Mom wears out quickly these days, and I don't think the art meant as much to her as the outing with Erin ... and me. But just as the visit wrapped up, I insisted we make a dash for the rooftop garden. Such a good idea. It was heavenly. A huge thanks to the kind stranger who offered to take our photo. Erin and I will always remember this day. So glad we did that. Millie and I had our big adventure to Saint Louis, the town where I grew up. It was a wonderful trip and busy, busy, busy! I stayed with three friends over four nights and taught two days of workshops at Mary's studio. For some reason, I can't teach, talk and take photos at the same time. But I'm pretty sure everyone had a really nice few days at the studio and in their classes. Me, too. Now it's time to prep for France. Millie's a good little traveler and pal. Thinking I might have to make a tiny beret for her. Mais oui! First things first. Mo ran her half marathon in San Diego with great success! It was her first race and she hoped to do two things: run it all the way through without walking and finish in less than 2 hours. She did both, beating her time by 1.5 minutes! From NY and the miracles of technology, I was able to follow her using the Find Friends app on my phone. So cool. For two hours, I watched the little purple dot move through the San Diego streets and highways and cross the finish line. Maggie and James were actually there, saw her twice on the course and met her at the finish. Big thrills all around! And a big thank you all for your support and interest in her effort. She raised almost $6,500 for blood cancer research! While hovering and watching that little purple dot, I finished my Cedar Ridge sampler. Heather finished hers too and I love, love her version, especially the bunny with the fluffy tail. If I stitch it again, I'm doing that. At her suggestion, I opened a flickr group for you on the right sidebar. You can post your photos and share what you are doing with my designs, finished or in-progress. It's really exciting to see what you are making! Also I want to introduce my new pal, Millie. Although I've had her for years, I just rediscovered her in some jumble inside the studio. One snapshot turned into several and it seems she's starring in a series of random adventures around here. Today she heads to Saint Louis with me and then to France in a few weeks. You can follow her on my Instagram feed (housewrenstudio, #hws_millie). Early summer is as colorful in bloom as spring was. The roses are fantastic! And the comments on the giveaway post were equally as beautiful. Thank you so much for your kind words of encouragement. Each one meant so much. The winner chosen by the random number generator is MoniQ! Must say, I love it that she found me at the library. Thank you all again. Wishing you a week of beauty and joy. We had an inspiration dinner for Mo the night before she left for San Diego. The race is tomorrow and I know lots of you are rooting for her. For our celebration, Maggie made these shirts for everyone as a surprise. And I made cupcakes. We are so proud of our girl! Just for trying, for all the hours of training and for all the money she has raised for blood cancer research. Big, big thanks to many of you who contributed to her page! She raised enough money to attend the Top Fundraisers Dinner! I'll be back to let you know how it goes tomorrow. We're all really happy that Maggie and James are out there to cheer her on. Go Mo Go! We love you!! And a reminder to sign in for the big giveaway on the last post. Thanks so much for the encouraging and kind comments. You are amazing! With your help, I've crossed a little finish line of my own. This is 1001!